Office Space - Aldridge, West Midlands County. 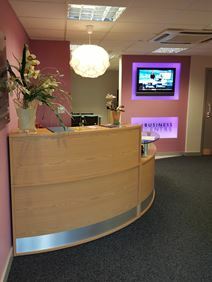 Situated in Aldridge, close to Walsall town centre and only a few miles from the heart of Birmingham this business centre provides all inclusive two to five desk office suites that benefit from a wide variety of business support services. There are great facilities including WiFi, telephone answering, a dedicated high-speed broadband line and conference facilities. The surrounding areas includes places to eat and drink including Costa Coffee.